Critics say the deal undermines the Nuclear Nonproliferation Agreement. They also say it sends the wrong message to leaders of North Korea and Iran who have ignored international calls to stop their nuclear weapons programs. The last I heard Iran doesn't have a "nuclear weapons program". What I don't understand is how India and North Korea can break the NPT with nuclear weapons and not be subject to the same scrutiny and ire of the UN and IAEA as Iran is for having a civilian nuclear program to provide fuel. In fact Iran was fully complying with the IAEA and recent articles show there is absolutely no proof of nuclear weapons programs. This in itself is a dangerous precedent because it shows that even abiding by the NPT is not acceptable just because the US says it isn't. The situation seems no different than Iraq who supposedly had WMDs which there was never any real proof of and that the US admits don't exist. At this rate a repeat of Iraq in Iran seems inevitable. The United States and India have signed a controversial nuclear agreement representing a major shift in American nuclear policy. 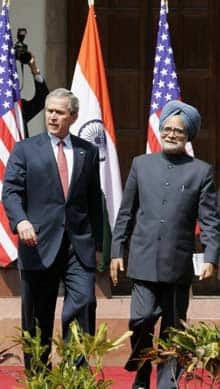 "We concluded a historic agreement today on nuclear power," U.S. President George W. Bush said on Thursday after meeting with India's prime minister, Manmohan Singh. "It's not an easy job for the prime minister to achieve this agreement, I understand," Bush added. "It's not easy for the American president to achieve this agreement, but it's a necessary agreement. It's one that will help both our peoples." The accord calls for the United States to share its nuclear expertise and fuel with India to help power its fast-growing economy. India won't sign the international nuclear non-proliferation treaty, while Washington imposed temporary sanctions on India in 1998 after it conducted nuclear tests. The deal hinged on a last-minute agreement to separate India's tightly entwined civilian and nuclear programs. It was important that India open its civilian program to international inspection in a way that satisfied both sides. A senior U.S. administration official said India classified 14 of its 22 reactors as civilian, which would subject them to international inspection. India classified the other eight as military reactors and exempt from inspection. Bush said the deal could be good for U.S. consumers. "It's in our economic interests that India have a civilian nuclear power industry to help take the pressure off of the global demand for energy ... To the extent that we can reduce demand for fossil fuels, it will help the American consumer." U.S. Congress must still approve the deal, and Bush acknowledged it would be hard to persuade legislators to change decades of law that has punished countries such as India for developing nuclear weapons. Also on Thursday, a car bomb killed five people outside the U.S. consulate and Marriott Hotel in Karachi in neighbouring Pakistan, the country next on Bush's itinerary. Bush said he would not be put off from visiting the country, a key ally in his war on terror. Is Islam Really The Religion of Peace that Muslims Practice? Why do Muslims come to our country? A reminder from the Qur'an that without Allah's permission we succeed or fail. Qur'an Surah Revelation - Location Which Surah was revealed in Madinah/Makkah(Mecca) ? Rebuttal to anti-Islamists who say the Qur'an allows the killing of disbelievers. Why Is the Middle East in a State of War? Is it Haram/Not Allowed to read, understand follow Islam by the Holy Qur'an in a language other than Arabic? Time Magazine Explains the Israel & Palestine Situation - "The End: How It Got That Way"
Judge orders release of Uighurs into U.S.
An attack in a Muslim-majority province in far western China has left 16 police officers dead. UN says reported U.S. abuse of Afghan prisoners is "utterly unacceptable"
Many people think Muslims believe in their own god called "Allah" but the literal translation is just "God". Muslims believe there is one god and one true creator and that it is the very same god the Christians and Jews believe in.